My first visit to the land of Annie Lenox, Alexander McCall Smith, The Proclaimers, shortbread, Arbroath smokies, tartan, and bagpipes. Within walking distance of our rented holiday home, I spy cathedral ruins, a medieval tower, the beach from Chariots of Fire, one of the most famous golf courses in the world, and Scotland’s first university, known by the same name as the town. And while all these places get my attention, the first photo I take is inside a little cheese shop. Handmade cheese is piled high on counters and tables. The room smells like roasted velvet. If you’ve ever stood too close to an open fire in a velvet dress, or trousers, you know what I mean. Startlingly pungent. I can’t resist. I go for the local, unpasteurised Anster Cheese. The woman behind the counter tells me it comes from Holstein Friesian cows. I am pleased she takes me for someone who knows her cows. I might have assumed Scottish cheese comes from Scottish Highland cattle, though of course I don’t say this. Cheese is an ancient food. It represents some of our earliest attempts at manufacturing. Around the time we figured out how to keep livestock, we began experimenting with the process that would allow us to make cheese. By the 13th century, the first cheese cooperative was being run by enterprising women in France. With the exception of France’s Triple Cream Brie, Italy’s Parmigiano Reggiano and Spain's Manchego, I was not a cheese lover until moving to England in 2005. 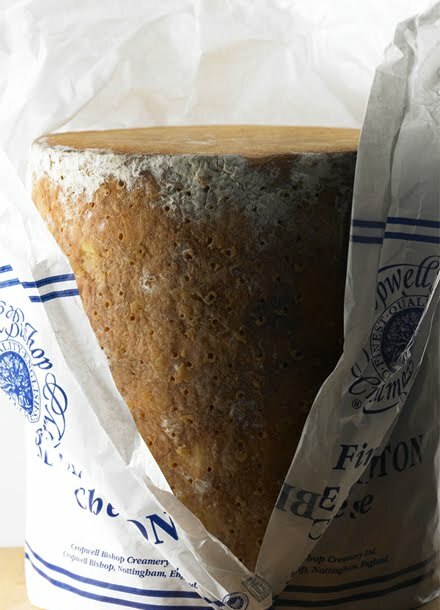 British friends awakened my mould deprived taste buds with cheese boards laden with Wigmore, Cornish Yarg, Connage Dunlop, Keen's Cheddar, and Stilton. herstory - though all traditional food comes with humbling tales of survival and resilience. I learn a place on foot, walking the town, smelling the markets, shops and cafes; observing the customs of the locals buying bread, sipping tea, asking the fishmonger about the morning’s catch, joking with the greengrocer. I explore as much with my nose, as I do with my eyes and ears. Here, in St Andrews, the local fish shop sells game, as well as fish. Venison, rabbit and partridge are tempting, but pricey and not unique to this part of the world. I can get the same seasonal meats from our local butcher and farmers market. I have decided I will buy food unique to this part of Scotland, like the carefully wrapped cheese in my shopping bag. The local baker sells me a loaf of his most popular bread, dark, dense and oaty, the perfect accompaniment to cheese. Instead of dining at one of the local cafes, I head home with the bread and cheese. Our friends will be arriving this afternoon, exhausted from a gruelling, 12 hour flight from Northern California. 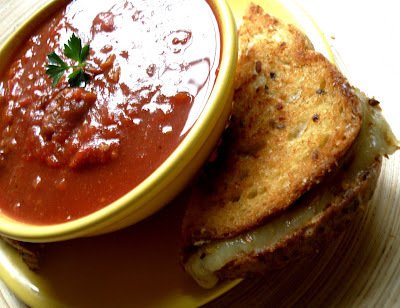 What better way to welcome them than with grilled cheese sandwiches and steaming bowls of homemade tomato soup? While I run the menu through my head (hand pressed apple juice and San Pellegrino water to drink) a sign posted in the local barber shop window catches my eye. It offers “Free Whiskey With Every Haircut.” Curious, I am tempted to venture inside and reward the clever barber with my business. Looking in the window, past the sign, I see that this is indeed a true barber shop, not some unisex salon. It looks to be a good place for a military style buzz cut. If our friends were not due to arrive in a couple of hours, I’d get a trim. A glass of whiskey, with a haircut, is such a jolly idea. I am happy to travel 500 miles for such originality. I would never see such a promotion in London or San Francisco. It is probably against all sorts of silly ordinances. We need fewer rules and more rule breakers in the world. Imagine bookshops offering a free glass of wine with every book sold. Clothing stores handing out complimentary chocolates with every purchase. Furniture stores sending customers home with their receipt attached to a warm box of freshly baked cinnamon buns. Dry Cleaners giving patrons roasted cashews. Department stores plying us with pretty cupcakes. Computer stores courting us with pizza and beer. Travel opens us to the unexpected. It encourages us to see things in new light, literally and figuratively. It broadens our minds by showing us possibilities we may not have considered closer to home. Nearly every moment offers opportunity for exploration and discovery. Familiarity may not breed contempt, but it does breed boredom. The hunter/gatherer is never more alive than when in a new environment. Whenever I am in an unknown place, I like to explore it s-l-o-w-l-y on foot. Alone. No distracting conversation. No agenda. No clock watching. Mobile phone on vibrate. Camera at the ready. This is as close to freedom as I have known, outside of natural environments. If only hunger was as easily satisfied. I don’t need a watch to tell me my ramblings have come to end for today. Back to the house, where a large, unfamiliar, Scottish kitchen is warmed by a handsome, blue Rayburn. This will be my first experience cooking on a cast iron cooker. I love the substantial look of the stove, though making soup and grilled cheese on it feels like driving a Ferrari to the laundromat. I might have gone with the partridge, if one of our Californians wasn’t vegetarian. 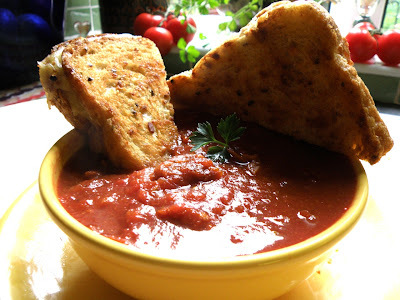 My favourite autumn lunch combination is mature, cheddar type cheese, grilled on firm, buttery bread, dipped into a bowl of thick, tangy tomato soup. Place sun-dried dried tomatoes in heat proof bowl and cover with boiling water. Allow them to reconstitute for at least 20 minutes, while you make the rest of the soup. 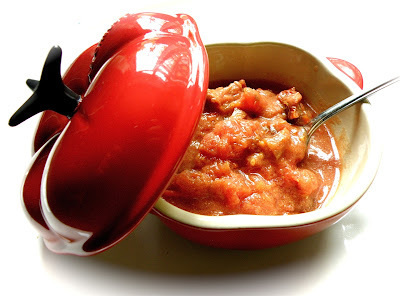 In large pot, combine chopped tomatoes (juice and all) Worcestershire sauce, chipotle sauce, cumin, salt, pepper, and sugar. Cook over medium heat, stirring occasionally, until mixture comes to a boil. Reduce heat to low setting and simmer 20 - 30 minutes on low heat, stirring often. 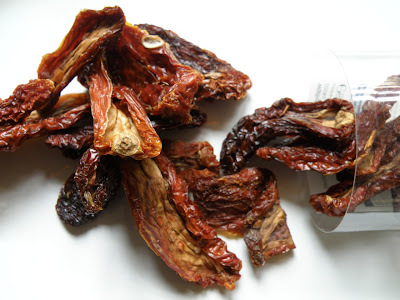 When sun-dried tomatoes have reconstituted, place them, juice and all, in blender. Fit the lid on tight. Holding lid firmly in place, blitz tomatoes on low speed for about 30 seconds. Add to soup pot and blend well. Soup will be thick and chunky, if you prefer yours smoother, allow to cool, run through blender. Return to pan, add a little extra water and re-heat. If soup is too spicy for you, stir in a couple teaspoons of cream, sour cream, or plain yoghurt, just before serving. Serve in large bowls and garnish with a bit of basil, dill, fennel, of parsley. If you’re making more than a couple of grilled cheese sandwiches, set oven to warm, line a baking sheet with foil and place sandwiches in oven, one-at-a-time, while you work. 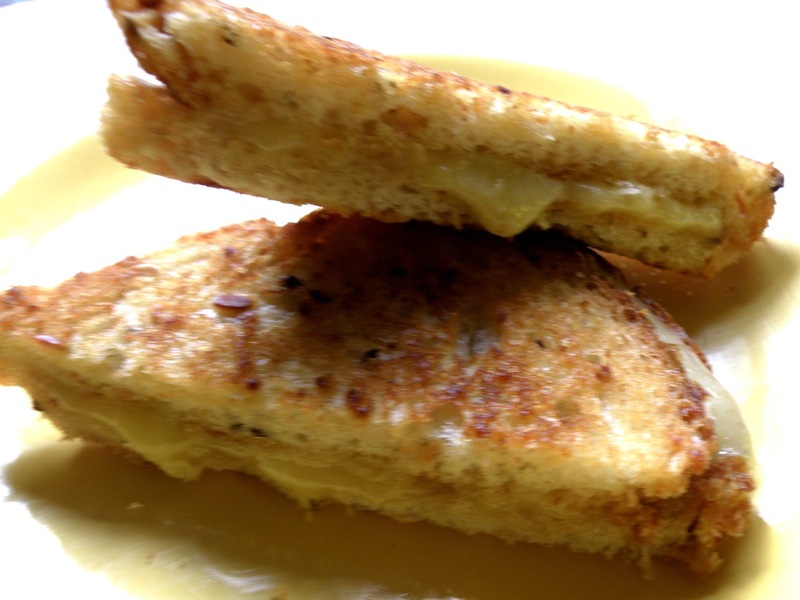 I like grilled cheese super toasty, so once the sandwich is assembled in the skillet, I rotate it from side to side until it is quite dark and firm --- but not burnt. When the sandwich is toasted to your liking, remove from heat, cut in half, or quarters, and serve with the tomato soup. Toss in a couple cups of finely chopped, steamed, broccoli, to get your daily dose of greens. For the carnivore, add a handful of homemade meatballs to the soup pot. A meal like this encourages a board game. Mexican Train Dominoes, Yahtzee, Monopoly, and Cluedo are popular forms of entertainment at our house. If you’re making a day of it, a plate of homemade cookies (peanut butter, oatmeal, chocolate chip) and rose scented lemonade, elevate the mood to party mode.